Global systemic fears re-emerged this morning, when in addition to ongoing concerns about trade wars which dragged Chinese stocks deeper into a bear market as the Yuan fell for a 10th consecutive day, now there are European banks to also worry about. Having been relatively stable for much of the recent slide, on Wednesday morning, Deutsche Bank came under heavy selling pressure, tumbling 5% shortly after the start of trading, and dropping to a new all time low of €8.76, and bringing its market cap to just $21BN. By comparison, JPMorgan's market cap is $357BN. ... however the dead cat bounce appears to be nothing more than a temporary respite: "Falling bellow the €9 level adds more pressure to the stock as that was seen as a technical low bottom,” Ignacio Cantos, investment director at ATL Capital in Madrid, told Bloomberg. The drop in Deutsche Bank sent the The Stoxx Banks Index down 1.8%, to the lowest level since 2016. 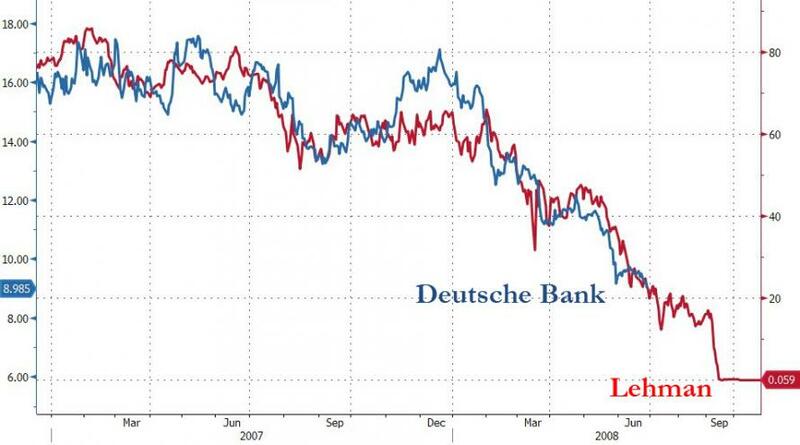 European Banks Index is now 14% down YTD, of which Deutsche Bank is the worst performer, down 44% YTD. And sent the index of the global systemically important banks to a 14-month low. What caused the slump? 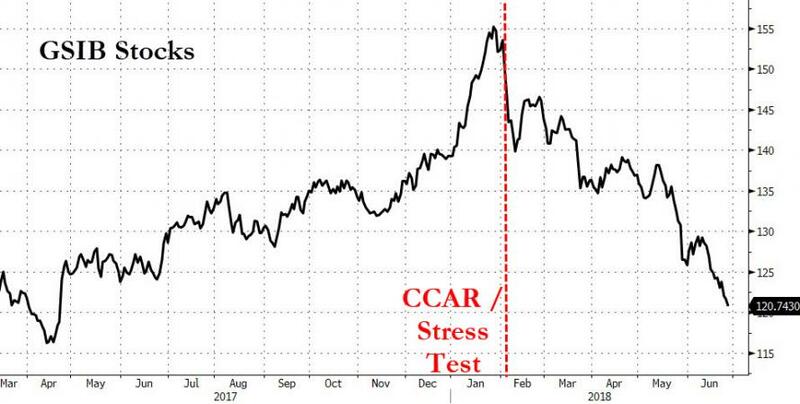 As Bloomberg's Paul Dobson writes, there is plenty to worry about besides the usual worries about trade wars, emerging markets, and Italy, including hedge funds warning of a crisis, talk of higher counter-cyclical buffers, as well as sliding bond yields, the deflationary bogeyman for European banks, which in turn is sending European credit risk higher this morning. Whatever the reason, it appears that whatever risks were latent and starting to emerge as a result of trade war concerns as starting to spread as contagion now hits Europe's arguably most sensitive sector.